Half marathon training (or mini marathon) will be challenging, but should be fun and enjoyable. Train right and enjoy lots of fun on the big day! 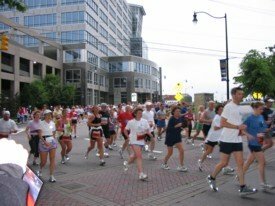 Are you a beginning runner? Already a runner? Haven’t run in a long time? Either way, you can finish a half marathon. Learning some of the basics will help you get started. Building mental stamina is essential. It’s one thing to be motivated to begin training. It’s another to stay motivated every day. Staying motivated and developing the proper mindset is key to enjoying training and crossing the finish line with a smile on your face. Finish time goals, weight loss goals, “just finish” goals…we all have a reason(s) for wanting to run a half marathon. If your only goal is to lose weight, good luck. You’re likely to quit. You are likely to quit just like so many people who join health clubs each year for the same reason only to stop going after seeing little results in little time. You must have the right goals and reasons for running in order to be successful. Carbohydrates provide the fuel runners need. During half marathon training, 65% of your total calories should come from carbohydrates, particularly complex carbohydrates. 10% should come from protein (you need 0.5 to 0.7 grams per pound of your body weight each day). 20-25% of your total calories should come from unsaturated fats. Be sure to get the nutrition you need to keep you strong and allow for adequate recovery. Obviously, it is important to run for half marathon training, but recovery is equally important. You should not run every day. Your body needs to rest between runs so it can recover from one run to the next, getting stronger between each run. Nutrition and eating the right foods at the right time also play a vital role in recovery. Take recovery days equally as serious as your running days. On runs of an hour or more, carry fluids with you and consume 6-8 oz. every 20 minutes. During pre-training and marathon training, weigh yourself before and after each run and get your body weight back to the weight it was before the run by drinking water or sports drink within the first hours after the run. Before you begin half marathon training, you should be able to run for at least 30 minutes without stopping. Distance is not important right now. You just need to get your body used to running. It’s also a good idea at this point to go ahead and select a half marathon and get signed up! Your mileage should gradually increase each week. As a general rule, total weekly mileage should not increase by more than 10% from week-to-week. Completing a run of 10-12 miles about three weeks before the race will be enough to prepare you for the finish. You should then taper off in the final weeks leading up to the half marathon to allow your body to recover from training and so you will be strong on the big day. 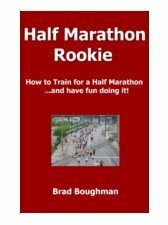 Following is a recommended beginner half marathon training schedule. This schedule assumes you have been running for at least four weeks and can run 30 minutes without stopping before beginning the schedule. Tapering in the final weeks before the half marathon will help your body recover from half marathon training and be strong for your big day. You will also want to carbo-load the week leading up to the race. Given the atmosphere at most marathons, you will likely feel full of adrenaline after leaving the starting line. Remember though, distance running is about endurance and pace is critical. Maintain pace to save everything you have left for your big finish!